"Chaos breaks out in a small Maryland town after an ecological disaster occurs." I didn't even manage to get through ten minutes of "The Bay" so you can make of that what you will. Just know that I've watched some truly terrible movies in my time and made it through to the end of all of them, but this was beyond my tolerance levels. 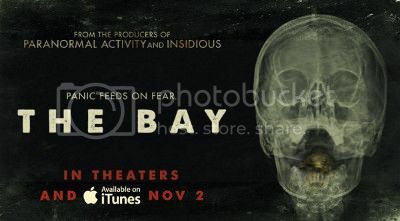 Cheap and nasty faux found footage movies are one of my least favourite parts of the horror genre so, in fairness to anyone who can make it through this, "The Bay" was never going to get much of a rating. Even if I'd had the patience to endure the horrible shakycams, the monotonous, nasal, whining voice of the girl narrating the story, the pathetic, low-budget effects and make-up, and the obvious lack of acting ability shown by anyone involved, I still would have written it off as crap. The fact that it's another "From the producers of Paranormal Activity and Insidious" product designed to make a quick buck (from a subgenre that wore out its welcome back in 1999) should tell you all you really need to know. 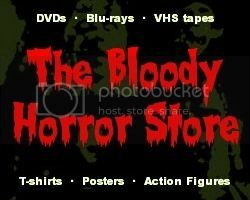 I've hated everything they've done so far and despised every "found footage" movie including "The Blair Witch Project". Apart from "Trollhunter", which was more of a parody, I've never understood the appeal or alleged popularity of this style of filmmaking. Based on under ten minutes of this awfulness, I can't tell you if there's even a story to "The Bay" other than a bunch of non-actors eating contaminated fish and dying, who the characters are (or who plays them), or if it's worth investing the time to watch the rest of it. It just wasn't for me.